I know that you are so very thankful for the little blessings in your life, but I can also see how much pressure you are putting on yourself. But, I’m here to tell you that you are doing a great job! I feel you…. I know the pressure that we as moms can put on ourselves. I understand the struggle of balancing being a wife, mom, work and home life. We try to be everything to everyone, but please hear me when I say….. you are doing much more than you give yourself credit for. Seriously, pull at my hearts strings!!! Here’s the thing… as much as we think we are less than, to our little ones…..we are more than enough. Stop putting so much pressure on yourself. 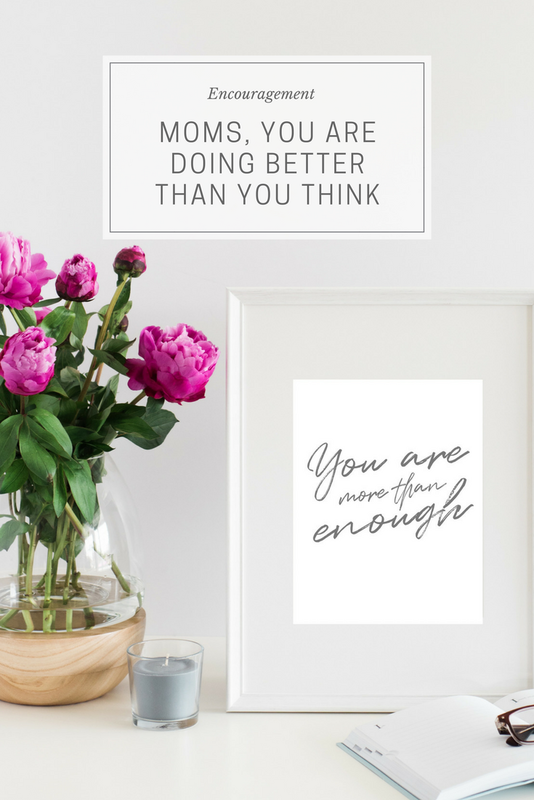 Do your best in whatever you are doing and push that mom guilt to the side. Everything that we do is teaching our children. Do we want to raise our children to doubt themselves? To be hard on themselves and think that they are never enough? Of course not!…. so let’s not set that example for them. I get that not feeling guilty is hard. It’s something that we need to constantly be aware of and work on. God didn’t make us to be perfect, he made us to be the best us we can be. Think of it this way…. what do we constantly tell our children when they are doing something?…. “Just do your best.” We don’t except them to be perfect, we just want them to try their best. I promise you that you are more than enough and you are doing better than you think.